The Las Vegas Metropolitan Police Department is finally starting to release portions of the footage from the body cameras worn by the officers who responded to reports of a mass shooting on 1 October, and the footage that has been made public is showing that officers’ accounts differ from the official narrative. 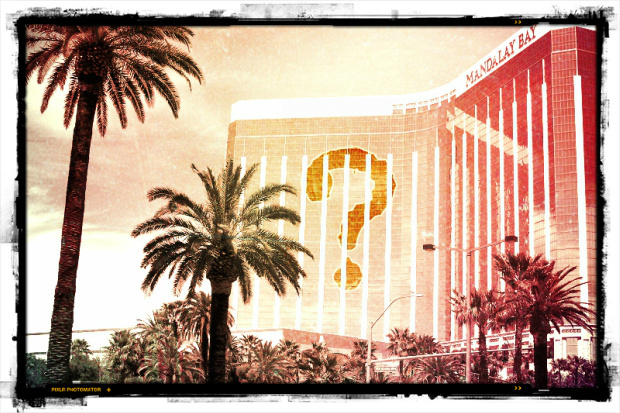 Suspect Stephen Paddock is alleged to have transported dozens of firearms and thousands of rounds of ammunition to his adjoining hotel rooms on the 32nd floor of the Mandalay Bay Hotel where he broke the windows and used his perch to open fire on a nearby music festival. 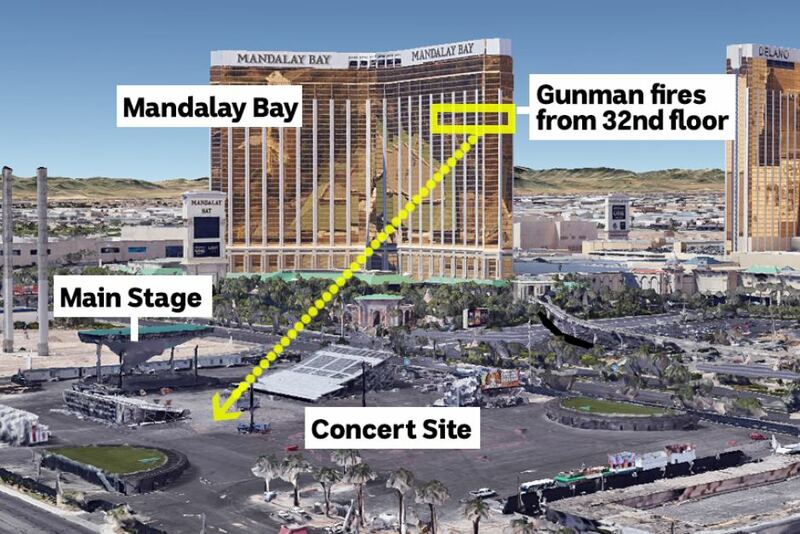 In the body camera footage, LVMPD officers can be seen clearing the rooms on the floor, and waking up other hotel patrons who were in bed near where the massacre was said to have been launched and were apparently unaware that any gunfire had taken place. Following entry into their room, an officer informed the patrons in their beds that there was someone shooting inside the casino. In fact, one of the patrons who sounded like a female seemed shocked a shooting was taking place. She said, “Oh, ok.” The tone of her voice seemed to indicate that she had no idea a shooting was reportedly taking place just feet from their room. Also interesting was the officer’s order for them to “lock the door.” Who were these patrons and why were they not interviews by the press? “It’s not, it’s not, it’s not [broken] — Corey it’s not,” one officer makes clear. At one point in the recording, officers passed by the window where Paddock was supposedly “setting up” his sniper’s position. Another officer stated that he counted 13 weapons with one being scoped. At the end of the video, a “players card” with the name “Marilou Danley” was discovered. The confusion over whether or not there was a broken window in the room will likely fuel the fire with fodder for conspiracy theorists who believe there is much more to the story than what authorities are willing to reveal. While the official timeline of the Las Vegas shooting has changed multiple times, one thing has remained the same—the claim that after opening fire out of the window of his room on the 32nd floor of the Mandalay Bay Hotel, Stephen Paddock shot and killed himself at some point between 10:15 p.m. and 11:20 p.m. on Oct. 1, 2017. 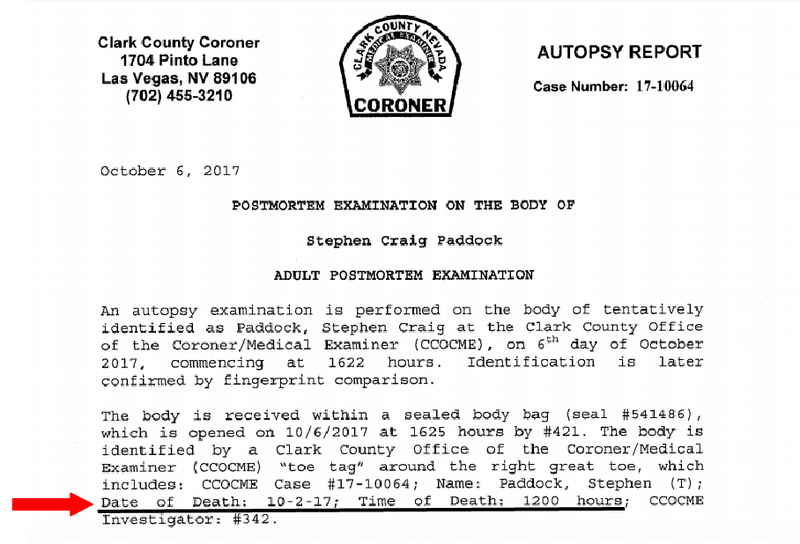 However, the autopsy report released by the Clark County Coroner claimed that Paddock actually died at 12 p.m. on Oct. 2, 2017. Paddock’s Brain was examined in pieces revealing the trauma he sustained following the impact of a gunshot wound to the head. The examination was conducted by Stanford University pathologist Dr. Vogel on Nov. 27, 2017. As reported, LVMPD’s desire to keep the body camera footage and surrounding information secret was so overwhelming that they fought its release all the way to the Nevada Supreme Court. On Friday, the court rejected the police department’s bid to keep the records secret and they are now forced to hand everything over. On Wednesday, the department began releasing footage from the officers’ body camera as they entered Stephen Paddock’s suite in Mandalay Bay on the night of the shooting. 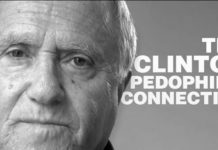 Not surprisingly, Clark County Sheriff Joe Lombardo announced on Tuesday that the first officer into the room that night, Levi Hancock, did not activate his camera. “I don’t know how this footage will be played in the media, but I want to warn you, if you are a survivor or a family who lost a loved one, you should know the video from this concert is disturbing and graphic,” he said. 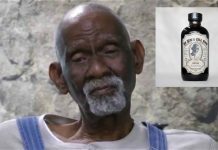 Taken as a whole, the comments made by the officers who were searching for broken windows in the hotel room, the date and time on the coroner’s report, and the fact that the brain was not examined until nearly one month later, leaves many people scratching their heads with more questions than answers. In addition to that, the body camera footage shows that the people in the rooms surrounding Paddock’s room were sleeping peacefully in their beds, and they seemed to be unaware that the worst mass shooting in modern U.S. history was taking place just feet from their rooms.